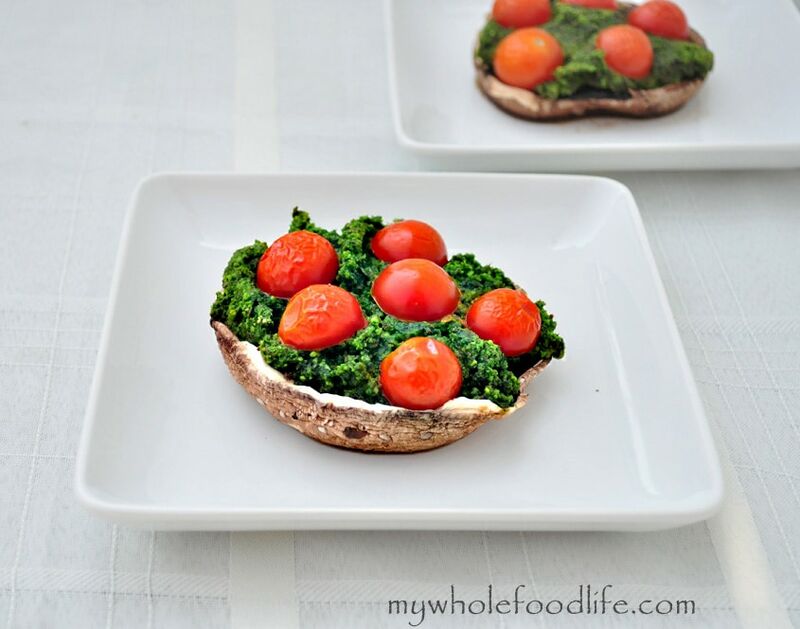 If you were to ask me what some of my favorite veggies are, spinach, mushrooms and cherry tomatoes top the list. So, I thought I would combine them together to make this super easy meal. This meal is so easy to put together. I made the whole thing within just a few minutes after we got home from my daughter’s soccer game. This meal comes together in minutes. It really is no trouble at all. For the pesto, I used almonds instead of pine nuts because pine nuts can be so expensive. The almonds worked out great. I also use nutritional yeast in place of cheese. Nutritional yeast is super healthy and actually is a great source of B12. B12 is one of the few vitamins that is hard to find in a plant based diet. It also has a cheesy and nutty flavor and that is why it’s used in place of cheese. This was the first meal I made using some ingredients from our garden. The basil is flourishing so I plucked a whole bunch off. It grows back so fast. In a food processor grind up all the ingredients except the mushrooms and tomatoes until a pesto forms. If the mixture seems a bit dry, you can add a bit more oil or even a little water. Grease a baking sheet and lay the mushrooms on it. 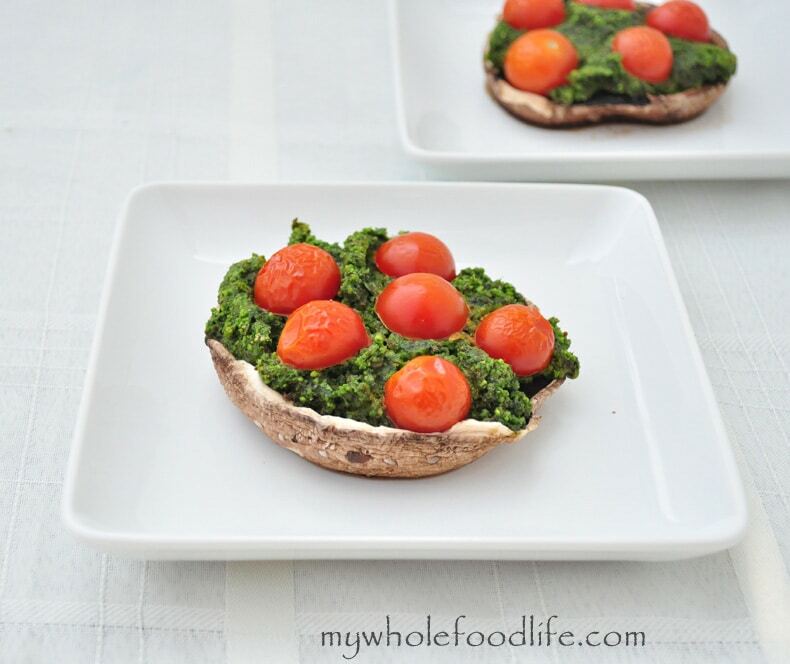 Fill each cup with pesto and top with the cherry tomatoes. Put in the oven for about 20 minutes. We were actually going to make 4 mushrooms, but my husband butchered one in the process of removing the stems. That is why in the picture, the caps are filled to the brim with pesto. They were still delicious, and I wish we had leftovers, but they were all gone quickly. I hope you enjoy them as much as we did! These were so so easy and so flavorful!!! I will be making them at least once a week now. theyd make a good lunch for myself with a salad. I made them tonight as an app with my hubs ( a meat potatos and beer guy) I was nervous and said "dont like them?" Because he didnt say much ( I also added a slice of cheese to his) He said "No, they're actually pretty good" Which is is highest accolade for food!! I made the pesto last week with the quinao pasta and it was the best pesto I've ver had. I froze 4 cubes, thawed and used them with the mushrooms tonight. I will never buy canned pesto again. I think it could! I would not cook them at this high of a temp though. You are so welcome Shannon! I made these tonight with my 3 and 1 year old and substituted kale for spinach and aded cilantro and a bit of lemon juice.... these were soooo good!!! Even my three year old was eatin it up! Thank you! I think I will make it again on Saturday for my relatives! I love your recipes!!! Made these last night and the whole family ate them all up. Even the 3 and 1 year olds. And the 1 year old normally refuses to touch anything green. These were delicious and definitely going into our regular rotation. Thank you! You're welcome Andrea! Glad you enjoyed them. I would like to make this as a main meal and was wondering if you have any suggestions what I can serve as a side with this? Do you eat bread? Maybe some garlic bread? Another question! We can't find nutritional yeast. What can I use in place of that? Thank you!! It adds a cheesy and nutty flavor. You can probably omit it. I used parmesan cheese in place of the NY, it is awesome! This is probably the best pesto I've ever had, thank you!! Omg this is so good and so easy! I made the pesto and put it in the fridge so I can make the mushrooms for lunch the next couple days. I also used Parmesan because I could not find nutritional yeast. Another winner! My kiddos have nut allergies, so I replace the nuts with sunflower or pumpkin seeds. It's phenomenal in the pesto. I may try that sometime! Do you remove the gills from the mushrooms?